A bipartisan group of lawyers led by former Texas Solicitor General James C. Ho filed an amicus brief Monday in Austin, asking a judge to dismiss the case against Gov. Rick Perry. *Editor's note: This story has been updated to reflect that the amicus brief has been filed. "The flaws in this indictment strike at the heart of the separation of powers doctrine enshrined in the Texas Constitution, as well as the freedoms protected by both the First Amendment of the U.S. Constitution and Article I, Section 8 of the Texas Constitution," the brief, provided to The Texas Tribune by Ho, states. "So this prosecution must end immediately." Grand jurors indicted Perry on Aug. 15 over his threat in 2013 to veto funding for a state watchdog unit housed at the Travis County district attorney's office. Perry made the threat after DA Rosemary Lehmberg refused to step down from office following her drunken driving arrest and conviction. He eventually made good on the threat, withholding $7.5 million in state funds for the unit. He was charged with one count of abuse of official capacity and one count of coercion of a public official. Ho said he and two colleagues began discussing the idea of the brief a few weeks ago. They contacted other lawyers and asked them if they wanted to sign on. “We have no personal stake in this case. Indeed, we come from different political backgrounds," Ho said. "But conservative or liberal, Republican or Democrat, we are united in our commitment to the Constitution, and in our belief that this prosecution is terribly mistaken." 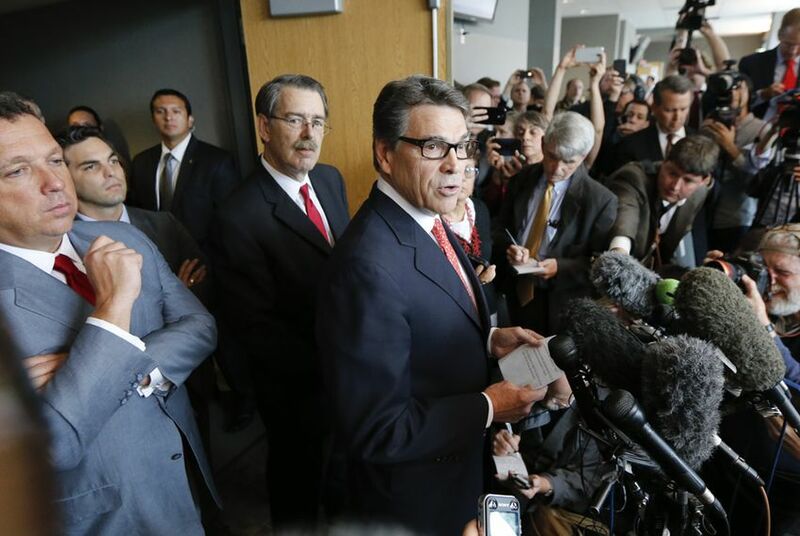 He also said that Perry's legal team was contacted to let them know the brief was being filed. He insisted the legal team did not ask Ho and the other lawyers to file it. The Democrats who have also signed the brief include former Texas Supreme Court Justice Raul Gonzalez, former U.S. Attorney Paul Coggins, former state Sen. John Montford and Jeff Blackburn, founder of the Innocence Project of Texas. Well-known Republicans on the brief include former U.S. Solicitors General Ted Olson and Ken Starr. Olson served under President George W. Bush. Starr, who is now the president and chancellor of Baylor University, served under President George H.W. Bush. Other prominent lawyers who signed the brief are Alan Dershowitz and Floyd Abrams. News of the brief was first reported by KVUE-TV and the Austin American-Statesman late Sunday.